Close to the Panhandle in the Delta’s north-west, the Jao Concession’s vegetation varies from east to west: from the magical Jao Flats – picturesque floodplains with lush palm islands and riparian forest – to the dryer Hunda Island, covered in acacia and mopane woodland and the largest area of dry land locally during the annual floods. Around the Jao Flats spectacular herds of red lechwe are followed by the primary predators – lion and leopard. Other game includes wildebeest, tsessebe, giraffe, elephant, hippo and crocodile. Sitatunga are seen occasionally, and sightings of spotted-necked otter are regular. The drier habitats in the west harbour similar species with greater concentrations of zebra and wildebeest. Birding is exceptional with large concentrations of endangered Wattled Crane, Slaty Egret, Rosy-throated Longclaw, Pel’s Fishing-Owl, and Lesser Jacana on the eastern side; the western drier areas are ideal for Crimson-breasted Shrike, Dickinson’s Kestrel and Meyer’s Parrots. 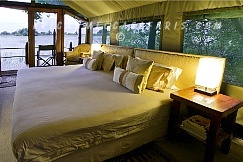 Jacana Camp is situated on a small island in the beautiful Jao flats area of the concession offering remote seclusion. 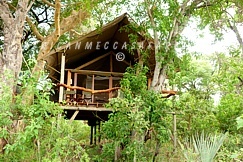 Accommodation is in five Meru-style tents, each raised on a wooden deck with a view. 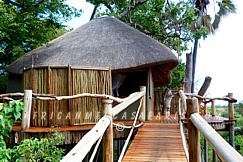 The en-suite bathroom is enclosed but roofless allowing views of the African skies. 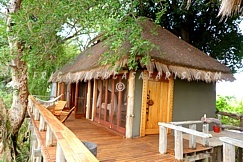 Jao Camp is located on a remote island in the heart of the Okavango Delta. The camp has nine luxurious tents, each individually handcrafted. The open-plan design of each includes a lounge, dressing area and main bedroom, en-suite facilities with old-style fittings and an outdoor shower. Tubu Tree Camp is a small camp built on the western side of the Jao Concession’s isolated Hunda island. Owing to its locale and easy access to diverse habitats, Tubu Tree ensures varied and spectacular game viewing. The camp is built in traditional style with five intimate tents on raised wooden platforms, taking in the marvelous scenery of the surrounding floodplain.